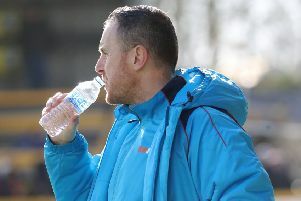 Max Wright is happy to do the dirty work if it helps Boston United climb the table. The on-loan Grimsby Town winger scored his fifth goal of the season on Saturday as the Pilgrims left Kidderminster Harriers with a 2-1 victory. But while the youngster looks the business going forward, he is also impressing manager Craig Elliott as he tracks back and takes a few kicks for the cause. “I’m really pleased to score, it’s my fifth of the season so I’m happy with that,” said Wright. As the Pilgrims prepare to host Leamington on Saturday (KO 3pm), they sit five points off the play-off spots. And Wright refuses to rule out a charge up the table. He added: “We always talk at training and before and after games about how important a run is in this league around this time. “Because you want to get as close to the play-off places as possible.